I visited my mom last week, and while I was there, we went through her Somersizing cookbooks. This recipe popped out at us, so we tried it. Since I’ve been home (less than a week), I’ve made it 3 times, which is a testament to how tasty and satisfying it is. I’ve changed it just a bit (i.e. made it better). The recipe is for one serving, and it is baked in a ramekin. If you want to make this for several people, you can either use several ramekins, or combine 3-4 servings in a 9×13 casserole dish. The visual appeal is higher in a single-serving ramekin, but they both taste great. Crack both eggs into a ramekin, and pour the cream over the eggs. There’s no need to mix things up; however the eggs and cream arrange themselves in the ramekin is fine. Sprinkle with salt and pepper, about as much as you would normally put on two eggs if you were going to cook them in a frying pan. 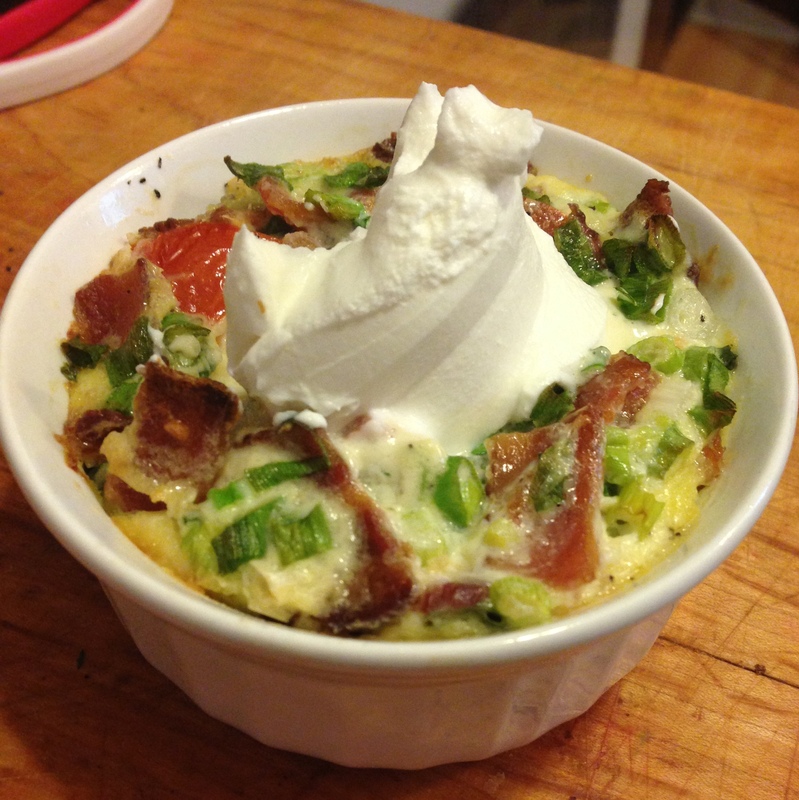 Spread the tomatoes, basil, bacon, and green onion over the eggs and cream, in that order. Things will sink down in the eggs, and that is according to plan. Pre-cooked bacon is perfectly acceptable, but if you have raw, wrapping a slice or two in a paper towel and microwaving for about a minute and 45 seconds will get very good crumbly results. For the basil, stack the leaves on top of each other and roll them up like a cigar. It makes slicing them easy peasy. As for the green onion, I recommend scissors. Bake at 400º for 20-25 minutes. The center should still be slightly jiggly. Let it rest for 5 minutes at room temperature for the eggs to cool enough to eat, and for the center to set the rest of the way. Put a dollop of sour cream on top, and enjoy. If sour cream is not your thing, putting shredded cheese on top before baking is just as good. If you can’t decide between the two, just have both.